UK company Pro-Teq has developed a new water-resistant, spray-on coating that absorbs UV light during the day and releases it at night, adapting to the lighting conditions in its surroundings. The technology is being given a test run at the Christ’s Pieces park in Cambridge, and could prove a cost effective alternative to conventional street lighting. We’re used to seeing solar-harvesting technology being installed primarily on rooftops, but other sufficiently irradiated surfaces, including sidewalks, are also being explored for their energy harvesting potential. Starpath doesn’t produce electricity, but it does offer a possible alternative to street lighting, with very low installation and maintenance costs, as it can be just sprayed onto an existing surface and then further coated to make it waterproof. According to the company, the coating absorbs and stores UV light during the day and releases it at night, when its particles are able to adjust to the available natural light, and glow with the appropriate level of intensity. 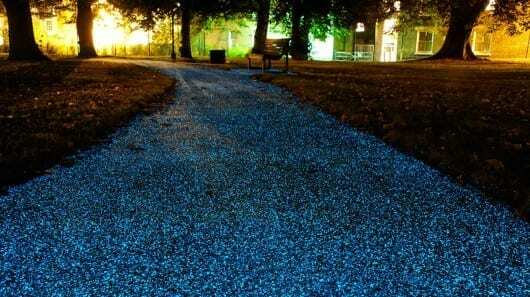 The coating is currently being trialled in Christ’s Pieces, a park in the center of Cambridge, UK, where it has been sprayed on a total area of 150 sq m (1,600 sq ft). Pro-Teq says the coating took only 30 minutes to apply, with the surface being ready for use after only four hours.